Jin Yong’s most contested love triangle, are you #TeamZhaoMin or #TeamZhouZhiruo ? Heavenly Sword and Dragon Slaying Saber the ninth 倚天屠龙记 airs two episodes every Wednesday, Thursday, and Fridays on February 27th. The classic wuxia novel is known for propelling the theory that the Ming dynasty was founded by and named after the Manicheist Ming sect. Heavenly Sword and Dragon Slaying Saber the ninth announced its release date of February 27th with a new trailer and a few posters. The series stars Zeng Shunxi, Chen Yuqi, and Zhu Xudan in a fight between three religions and three countries. Both of the trailers have actually looked interesting to me, and given that there haven’t been a true-to-the-books version made yet, it’ll be interesting to see director Jeffrey Chiang’s take on it given his success with the 2017 version of the Legend of the Condor Heroes. The background of the poster looks just like the book covers of the Sanlian version! The trailer for Heavenly Sword and Dragon Saber the ninth but I believe the first adaptation of the latest edition of the novel actually looks super solid. The scenery, costumes, and choreograph all look natural, as does Zeng Shunxi’s acting minus one scene. At least three of the four female leads look dead inside every single scene, though. Zeng Shunxi as Zhang Wuji the 9th, at your service. Heavenly Sword and Dragon Saber the 9th 倚天屠龙记 has released its first set of stills. I’d always thought this is the perfect Jin Yong novel to adapt for melodramas with idol actors. Glad someone finally took the advice and went for it. The cast is at least pretty and young , and I already like this Zhou Zhiruo more than the last one. The new version of Heavenly Sword Dragon Slaying Sabre 倚天屠龙记, and is helmed by Jeffrey Chiang, the director of last year’s well-received Legend of the Condor Heroes 2017 (my first reaction to the news was that Deng Chao’s version was only a couple of years ago, until I remembered it aired way back in 2009). Zeng Shunxi has been cast as male lead Zhang Wuji, though he clearly lacks the skills to bring the character to life. I have higher hopes for Tang Yan’s new employee Chen Yuqi, who was serviceable in Princess Weiyoung. 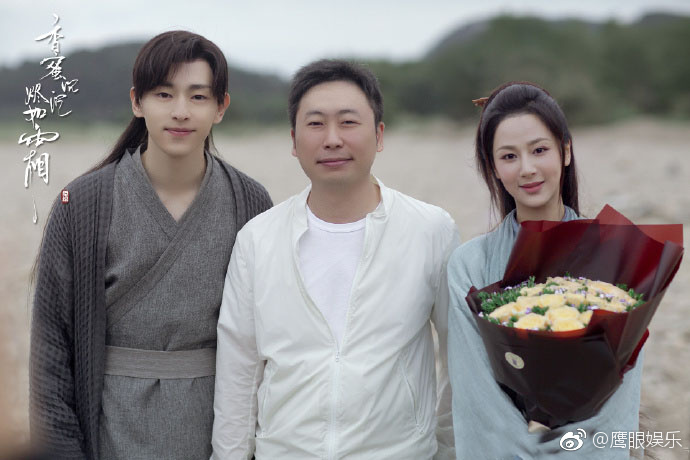 Two teasers have been released for Heavy Sweetness, Ash-like Frost, the upcoming fantasy drama that revolves around the romance between two deities, played by Yang Zi (Legend of the Dragon Pearl) and Deng Lun (Ode to Joy 2). I cannot express how much I love the maid’s dress behind Kathy Chow in The Empress of China. Everything from the design to the patterns to the colors are wonderful replicas of Tang-dynasty paintings. Much better than the random gold confetti dangling around Kathy Chow. More photos of Kathy Chow, Zhang Xinyu, and their maids below the cut.